Sorry, please select another size. Sorry, product not available. 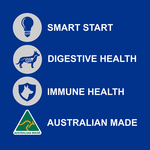 PetCircle offers Australia wide shipping on all products. Goods are dispatched within 24 hours of an order being placed. Delivery times will vary by region. 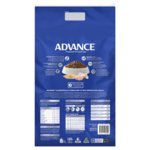 Advance dog food formulas deliver optimal nutrition for Australian pets using scientific knowledge and over 45 years of manufacturing experience. This super premium, Australian made, dry puppy food is complete and balanced to support the healthy development of your growing puppy. It is fortified with increased levels of DHA and choline to promote healthy brain development, as well as colostrum to help minimise the risk of digestive upsets. It also contains antioxidants to help strengthen the immune system, zinc and linoleic acid for healthy skin and a shiny coat, and prebiotic fibres to promote healthy bacteria in the gut for better digestive health and smaller, firmer stools. Want to know more? Find out more about Advance. Looking for a different dry food formula? 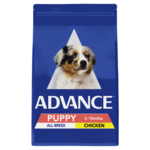 Check out our full range of Advance dry food formulas for dogs. Need to stock up on wet food too? 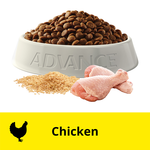 Have a look at our selection of Advance canned food for dogs. Is there anything else you need for your puppy? See our complete puppy checklist to ensure youre all set. Chicken, Maize Gluten, Chicken Fat, Rice, Maize, Sorghum, Natural Flavour (Chicken), Tuna, Beet Pulp, Sunflower Oil, Iodised Salt, Potassium Chloride, Inulin, Choline Chloride, Turkey, Taurine, Plant Extracts (Tomato Powder, Marigold Meal), Vitamin E, Colostrum, Zinc Sulphate, Vitamin C, Citric Acid, Calcium Carbonate, Antioxidants, Beta-Carotene, Iron Sulphate, Copper Sulphate, Vitamin B5, Vitamin A, Vitamin B2, Vitamin B12, Potassium Iodide, Vitamin B1, Vitamin B3, Selenium, Vitamin B6, Vitamin B9. These are broad guidelines only, designed to assist with feeding your pet based on their weight, age and activity level. 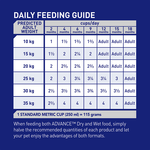 Always check the feeding charts on your pet's food packaging in conjunction with these feeding guidelines. Required amounts may differ between individual pets, and adjustments may be required to maintain optimal body weight. Once or twice daily feeding is recommended for adult dogs, unless otherwise specified by your veterinarian. Puppies and kittens require feeding more regularly, with the total portion divided into three or four meals throughout the day. Ensure fresh water is available at all times. There is no other product that grows puppies any better. 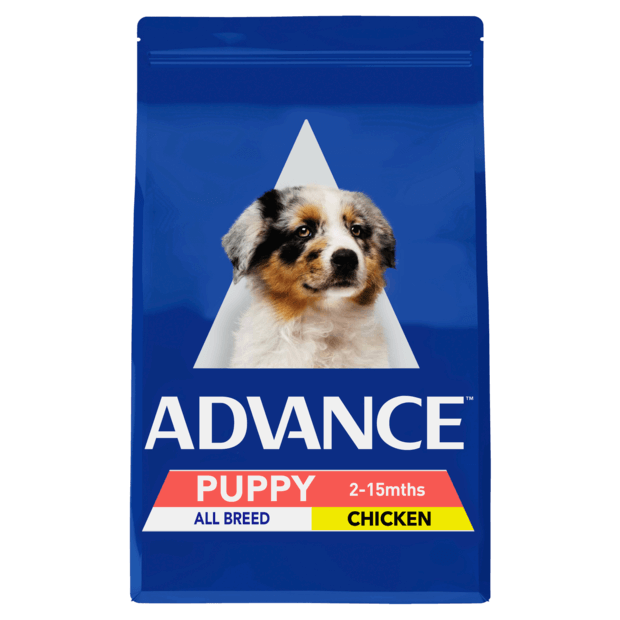 I have used Advance Puppy All Breed for all of my litters for over 15 years. I have always had healthy well boned puppies growing into physically sound adults. My English Staffy has been raised on ADVANCE Puppy All Breed. He loves the food and looks fantastic! I feed my beagle puupy this dry food. He loved the taste and his coat is so shiny. I recommend this food for puppies. Without doubt the best dry food for raising puppies - we've been using it since release and never had a puppy that didn't love it. Its easy to maintain weight and healthy happy puppies on this food. No tummy issues at all ever!